I am sitting here laughing at myself again! It's all about time and timing!...Don't we all wish we had more of it! Yesterday, I finished a tag for a friend, cut all my kits for my class in Chico, Ca. and finished a page in my art journal. (I will share the tag and journal page with you all in a separate post later today... I need to photograph them.) Anyway, I have so been meaning to work on the courtyard off my bathroom. Every time I look out there and see how bad it looks since the winter months, I say to myself, I'll work on that today....I've done this for about two months now! Well, just as the sun went down, I decided no more lookin'...It's time for ACTION! I raked, swept and brushed things off. I hung impatiens on hooks and cleaned out flower beds. Why the laugh? It was pitch dark! Me rooting around in the flowerbeds with a flashlight! There is some kind of self-awakening when you are up on a ladder hanging a wind chime by moonlight! Just Sayin'! Got to love country life. If I did this in the city, people would have called the PO-LICE! But, time is short and when you are moved to do something, for me anyway, I better DO IT! LOL! I looked out there this morning and by golly, it looks pretty darn good! Yahoo! Done! The coolest thing for me is to play in my art journal. I think the reason why, is that it's me trying new things out for one, but it's me playing...letting loose to see what will happen. It's a wonderful way to have a fun release from the stress of the day. I'm usually off playing with chipboard and measurements and my art journal is so completely different to me. Whether the page is good or bad it's a learning experience. What a wonderful way to capture your thoughts and feelings just by the stroke of a pen or paintbrush. Great pages. 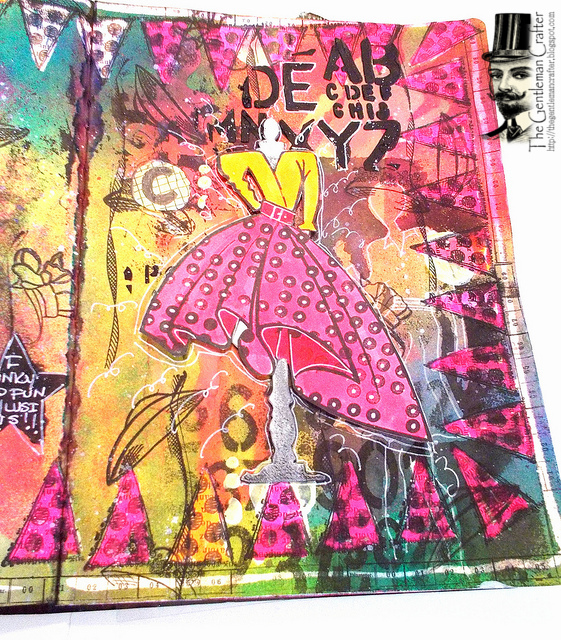 Do you ever do an art journal page and then wish you had done it on canvas? I LOVE everything about this page!! Great colors, fun banner border!!!! Your talent is amazing!!!! What gorgeous goodness you've created!! love the pennants as a border and the paler sprayed figures in the background!! I crave my art journaling too... I just love it and as you said it's that 'freedom'... no rules... trying out techniques... having fun... and no deadlines. :) Have a great Sunday and please share some pics of the courtyard! The art journal page should be framed and hung in the house. It's just gorgeous and very clever. Love it!! All my best work is done at night LOL! I am an Aries, so if I decide to do something it has to be right away! Patience is not one of my virtues! Please may we see a photo of your courtyard? It might inspire me to make a start in our garden. Your journal page is very colourful and must have taken you ages to do, with all that detail. Very nice! This is a fantastic journal page. It just screams of how much fun you must've had creating it. I have a lot to learn about just letting go!!! Lol at you gardening by flashlight.... love the journal page though!! I want to thank you. Thank you for sending me down the path of "get out of your box". I have been creating things that I would have never done before. Messy things, things that aren't perfect. I stopped thinking, what will other people say? You are right, it is uplifting, refreshing and darn right fun! Thanks for sharing your thoughts because we are actually listening! 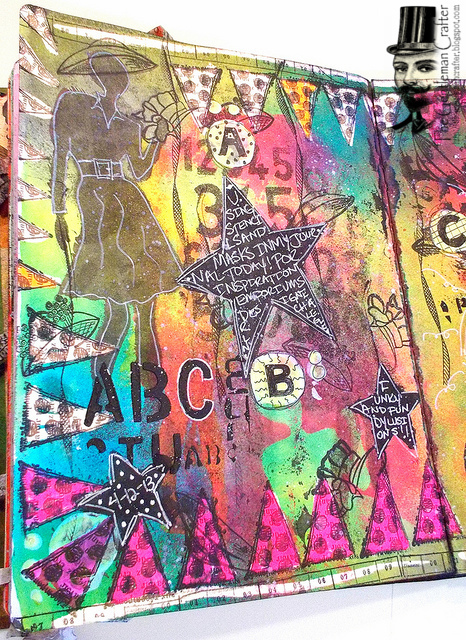 Love the art journal page! Really love the pennants border! Can't wait to see pic of your courtyard!! I love your Art Journal! This is a new adventure I am starting! Please keep sharing yours it's beautiful work as with everything you make. Wish I could go to your class in Chico but its about a 4 hour drive from where I am. Have fun! What a fun art journal page!!! I REALLY need to get back into mine. I have to laugh at the vision of you digging around in the dirt with a flash light...only you, Jim...lol!!! Yes, please, show us a picture of the "improved" courtyard! It sounds so pretty. 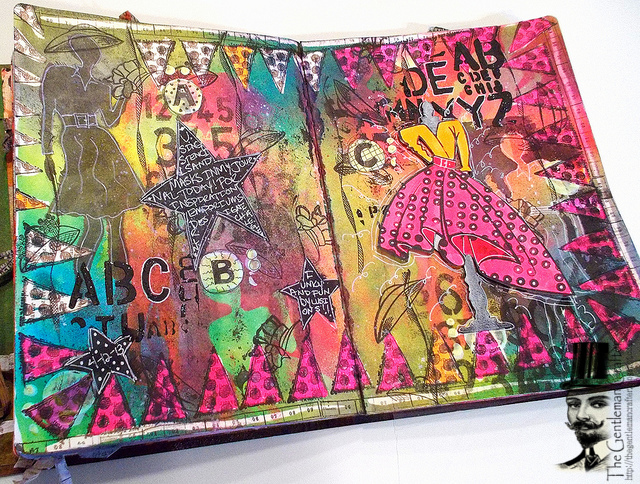 Am loving your art journal pages. So cool.I wouldn't know where to start. It looks so much fun. love it!!!!!!!!!!!!!!! we need to have another inky day and play in our journals.....jus sayin!!!! Love your journal pages ... looks like you thoroughly enjoy them ! It's beutiful but of course it is! And after reading your ditty about working in your patio area in the dark, I wonder if you EVER get any sleep? You're going 90 to nothing all the time it seems like. Please show us pics of your patio. Looks like you really let your hair down! (Sorry... bad pun! Hopefully you will laugh!) I think your pages look awesome! I completely understand about doing chores or tasks at the wrong time of day! LOL! I see you have a couple more posts for me to get caught up on!!! Be back in a bit!!! love the look and the brilliant color!